For the most part the major mass media supports the attack on Venezuela led by the government of the United States. They give the headlines to the US and EU charges against Venezuela, and imply that the Chinese and Russian refusal to go along with the American initiative at the UN Security Council is simply a revival of the Cold War. According to the news agency of the United Nations, some other countries also gave reasons to oppose the US initiative during the Security Counil meeting, as described below. Meanwhile, the website Common Dreams carries a statement from 70 intellectuals opposing the US initiative. JERRY MATJILA (South Africa) emphasized that, in any country, political parties choose the provisions on which to conduct elections. 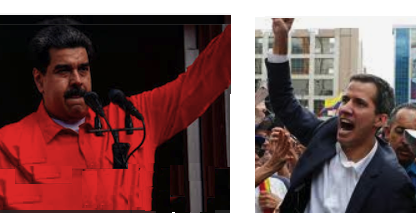 Recalling that Venezuela held presidential elections in May 2018 on the basis of its national laws, he voiced deep concern over the “clear attempt […] to circumvent the country’s constitutional legal mechanisms which govern its elections”. Any grievances or disputes should be resolved in a peaceful manner through the proper mechanisms, without external influence. Echoing calls for the swift de-escalation of tensions to prevent violence, and for the relevant actors to commit to inclusive and credible political dialogue, he urged the international community and United Nations entities to work with Venezuela and its neighbours to assist those in need. South Africa stands against any attempt at undue constitutional change of Government in Venezuela, he stressed, warning that the Council must never be an instrument that validates such attempts. ANATOLIO NDONG MBA (Equatorial Guinea) appealed to Venezuelans to arm themselves with courage and wisdom to overcome this crisis. The solution, aside from being peaceful and democratic, must be in accordance with the Venezuelan Constitution. The situation in Venezuela is an internal matter and does not pose a threat to international peace and security, and the Security Council must be cautious in that regard. The main focus of the United Nations and the Council should be on encouraging the parties to negotiate the differences that are “pushing them to the edge”. The international community “should not put fuel” on the situation, but rather, facilitate a dialogue. External interference will only exacerbate tensions. Recalling the suffering caused by foreign interventions in the Middle East and Africa — “only to change a regime and without any consideration of what could happen afterwards” — he said Equatorial Guinea acknowledges, respects and adheres to the constitutional order of Venezuela. He expressed hope that all parties will resolve their differences through dialogue, calling on Secretary-General António Guterres to use his diplomatic experience to mediate this crisis. PAUL OQUIST KELLEY (Nicaragua) reiterated his Government’s full solidarity for the legitimately elected President, Mr. Maduro. The situation in Venezuela does not represent a threat to international security, he added, strongly urging that the sovereign decisions of the country’s people be respected. The interest and insistence of the United States to include the subject of Venezuela in the agenda of the Security Council is another form of interventionist action into another nation’s internal affairs. Its clear objective is to impose a change of Government and replace the constitutional Government of President Maduro through a coup d’état. These actions do not contribute to a political solution, which belongs to the Venezuelan people as the ones to exercise their right to self-determination, he said. What characterizes the situation in Venezuela are the brazen attempts to destroy prior achievements made in health, education, housing and reducing poverty. Nothing should hinder the peace zone of Latin America and the Caribbean and therefore any threat of military aggression is condemnable. Venezuela is defending non-interventionism and the multilateral order based on independence, sovereignty and the equality of States. ANAYANSI RODRÍGUEZ CAMEJO (Cuba) said the Caribbean is the stage for threats that are incompatible with the region’s zone of peace, recalling that the 2014 proclamation signed at the second summit of the Community of Latin American and Caribbean States (CELAC) enshrined a duty to uphold the principles of the Charter of the United Nations, notably to refrain from interference in internal affairs, and respect for sovereignty and equal rights. The current United States Administration appears to have “dusted off the Monroe Doctrine”, and in a fresh extension of imperialism in the region, gone so far as to say that all options are on table. The region is like a lawn during a drought — a single spark could set off an uncontrollable fire that damages the interests of all, she said, calling it a “tinder box”. She rejected statements by the United States delegation made today, seeking to exploit the Council to illegitimately campaign against Mr. Maduro’s constitutional leadership. The main threat to the region is the bullying by the United States and its allies, she said, calling it a flagrant affront to the popular will of Venezuelans. She voiced unwavering support to the Bolivarian revolution, the union of the Venezuelan people and their democratic Government. She condemned in the strongest terms, attempts, through a coup d’état, to install a lackey Government to United States interests. She supported Venezuela’s right to chart its own future. She decried unilateral coercive measures, calls for a military coup to topple Venezuela’s Government, warnings that the use of military might is an option, the 4 August attempt to assassinate Mr. Maduro, actions by a group of countries, the shameful role of OAS and attempts to apply a worthless policy of regime change, which has been frustrated, time and again, by the resistance of the Venezuelan people. She advocated respect for the principles of the Charter of the United Nations, expressing Cuba’s unwavering support for the principles of sovereignty, non-use of force or the threat thereof, and non-interference in domestic affairs. History will judge those who push for a coup d’état, she cautioned. GARETH BYNOE (Saint Vincent and the Grenadines) said his county has been monitoring developments in Venezuela at the bilateral and multilateral levels and expressed deep concern over the unfolding events. Stressing his Government’s adherence to the principles of non-interference, non-intervention and sovereignty, along with respect for human rights and democracy, he emphasized the need for meaningful dialogue among all stakeholders. “We are undoubtedly living in an unpredictable era and must reject all attempts to aggravate dangerous situations or engender change of democratically elected leaders,” he said. The history of Latin America and the Caribbean is indelibly scarred by military interventions and imposition of dictator Governments. The need to triumph over its lingering remnants drives the countries in the hemisphere “to be viscerally abhorrent to any semblance of its re-emergence”. Constitutionally, Venezuela has an elected President in Mr. Maduro, but an unconscionable crusade against the legally elected President, orchestrated by OAS, aims to erect a parallel unelected Government. OAS has abdicated its role of arbiter. Venezuela is not a threat nor represents a danger to international peace and security. History teaches that rejection of dialogue is often the precursor to unilateralism and war, he said, an option that cannot be allowed in the region’s zone of peace.